Theory of Constraints session at XP2005, participants were given an experiential crash course in the Theory of Constraints. They then had to apply their new knowledge to solve real world problems. They did this in 3 groups. Each group had a “customer”, the others played “TOC consultant” to help the customer to understand and improve their system. 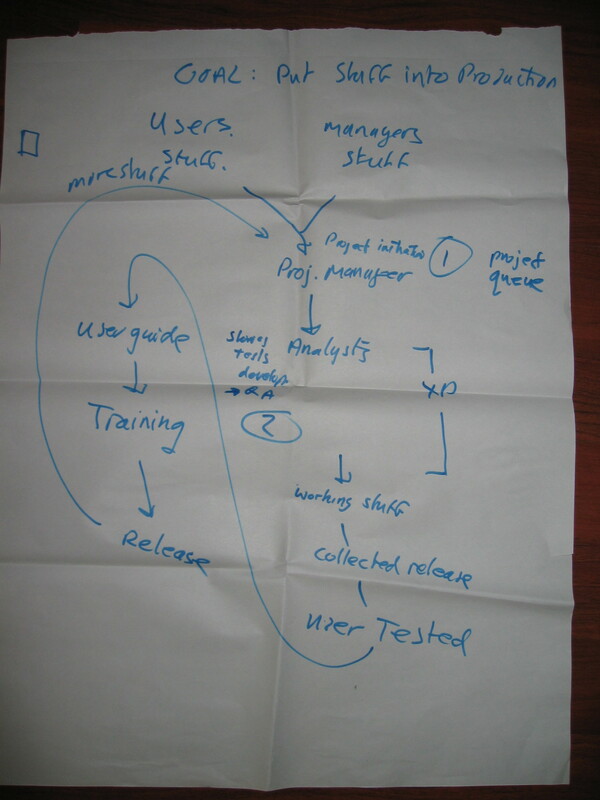 This is the output of one of the groups: it gives an overview of the whole process from requirements, over analysis, development, testing, writing manuals, training and finally putting “stuff” into production. The goal of the system is to “Put stuff into production“. An IT system can only generate value when it’s put into production use and users are actually using it (well). 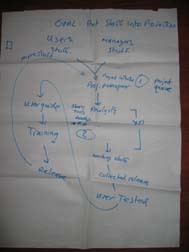 Hence the User Guide and training before releasing. Part of the value in releasing a system is the feedback and ideas you receive to improve the system, hence the loop back to project initiation. The bottleneck of this system was actually two bottlenecks (indicated as  and ), which ocurred at different times during the project. Bottleneck  holds the system back at the beginning of the project; bottleneck holds the system back near the end of the project. It’s not as bad as a “constantly shifting constraint”, but we need to focus in different areas depending on the phase of the project. Notice how the part marked with “XP” is between two bottlenecks. This is something that has been observed in many (if not most) XP projects: XP has very effective techniques to exploit, subordinate to and elevate a development team bottleneck. If you apply the techniques, the development team’s throughput improves a lot and it’s no longer the bottleneck. The bottleneck shifts. And who’s the bottleneck then? Usually the Customer (role) becomes the bottleneck, either in keeping the team fed with stories or in accepting the stream of finished features. Or both, as in this case. In the session we chose one bottleneck to concentrate on, the one the customer wanted to remove the most. Our newly graduated “TOC consultants” suggested several ways to exploit, subordinate and elevate these bottlenecks, coming up with some novel ideas that their customer could apply to this situation. What are some of the interventions we could suggest here? We have two bottlenecks, before and after “XP”. They are bottlenecks at different times in the project. If they are different resources, they could help each other out: bottleneck  resources can help (subordinate to) bottleneck  resources at the beginning of the project; and vice-versa at the end of the project. E.g. testers can help analysts at the start of the project by devising acceptance tests; analysts can help testers to perform and analyze acceptance tests.